This list of Chicago Writers provides easy access to, and an overview of, articles about them on this site. 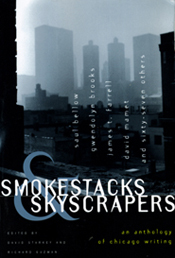 It’s based on the writers David Starkey and I included in our 1999 book Smokestacks & Skycrapers, and also contains some writers based on my 2006 book Black Writing from Chicago. Together these two lists will represent one of the best resources on Chicago literature as there is anywhere on the internet. Go here for the complete Black Writers List. Supplementing these two lists are five essays—the Introductions, Afterwords and Forewords to Smokestacks & Skyscrapers and Black Writing from Chicago—which give sweeping overviews of Chicago writing and lament those writers we were not able to include in these two books. These laments add important names to those listed below. Post about The Chicago Literary Hall of Fame. This entry was posted in Chicago Writing and tagged Black Writing from Chicago, Chicago Writers, Smokestacks and Skyscrapers. Bookmark the permalink.